We are going back fifteen years this month, a journey to the pre-iPhone era where smartphones were bigger, chunkier and altogether odder looking. 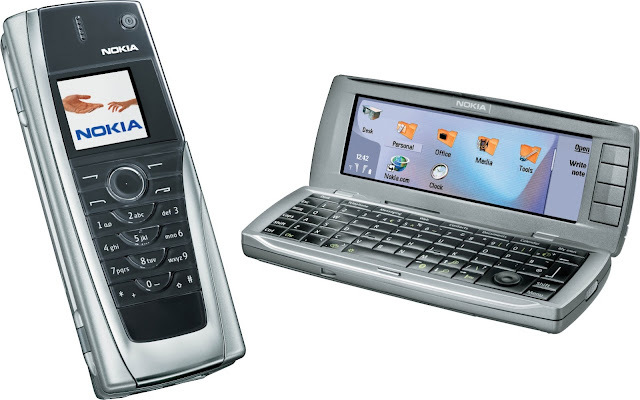 Nokia in particular had been pushing their own vision of what a smartphone should be with the Communicator series since 1996. These high-end devices looked like a normal albeit large mobile phone on the outside, but opened up to reveal a large screen and keyboard on the inside. In February 2004 they announced the Nokia 9500 Communicator. The display on the Communicators was like nothing else on the market, on the 9500 it was a 4.5” 640 x 200 pixel panel which was pretty good for rendering web pages, composing emails or writing documents. The keyboard was a little more cramped than the one in the previous 9210i, but it was still very usable. The 9500 was also the first in the range to have a camera, although it was only a pretty basic one. One major omission was the lack of 3G support – it wasn’t as it they couldn’t fit the components into this massive brick of a phone, they just chose not to. The 9500 did have WiFi though, so get it near a wireless hotspot and it could do a decent job of coping with a web that was still designed for desktop PCs. Nokia’s Series 80 platform was more capable than the Series 60 found in their other smartphones, and on top of that the 9500 had expandable memory, fax capabilities, a wordprocessor, spreadsheet and presentation application and if anyone tried to steal it you could bash them over the head with it. It was a reasonably successful device in the days when smartphones were still pretty rare, and over the years the Communicator range acquired a dedicated and rather patient fan base. All Communicator models are highly collectable today. Rivals Motorola were also eyeing up the QWERTY-equipped smartphone market, but they had a completely different approach. The Motorola MPx300 (later rename--d to just “MPx”) was a Windows clamshell smartphone with stylus-driven touchscreen inside. Unlike the large display in the Nokia, the MPx had a rather more modest 2.8” 240 x 320 pixel unit… this was still pretty good for 2004 though. The stand-out feature with the MPx was the remarkable two-way hinge that meant you could open it up like a standard clamshell or the mini-laptop format of the 9500. In order to support this, the MPx had a really strange keyboard that was QWERTY in one direction and numeric in the other. Although on one level this was a stroke of design genius, it also badly compromised the usability. In fact, the MPx was slow and had limited memory and there were hardware reliability problems too. Despite being announced in 2004, the MPx only got a limited release in Asia about a year later and by the spring of 2005 the worldwide launch was cancelled. In the end, neither phone set the pattern for future smartphones which these days are unencumbered by a physical keyboard. For collectors, the Motorola MPx is quite a rare find but surprisingly inexpensive at around £50 or so. The much more common Nokia 9500 is conversely more expensive, with unlocked ones in good condition being around £150 or so.